At some point, though, Foster wondered if she might be taking on too much. In addition to her lobbying work, she was speaking on many college campuses and developing special ads to reach college students, and was also involved with policy issues at the United Nations. She sought advice on priorities from two old Washington hands who had a wealth of organizational experience with the Peace Corps and the Special Olympics: Sargent Shriver and Eunice Kennedy Shriver. 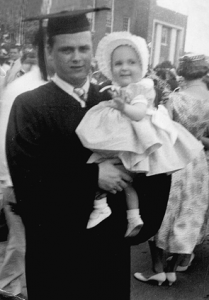 Foster had met Mrs. Shriver at a pro-life dinner in New York and later had helped her with a special event. They are making progress despite still having a small budget and staff. Their most recent Form 990 IRS report showed annual income of slightly over $500,000. Most of that came from contributions, and some from honoraria for campus speaking engagements.5 Besides Foster, the group currently has one other full-time staff member, Cat Clark, plus two part-timers. Now based in Alexandria, Va., they have what Foster calls a “boutique office.” They receive help from volunteers around the country, including women who have valuable professional and media experience. Their summer-intern program trains students who are ready to lead when they return to campus in the fall. And FFL works closely with Students for Life of America, a relationship that has strengthened both groups. Contributors to the FFL magazine, The American Feminist, have made it a lively publication. One issue focused on low-cost ways to raise children. Several others described “Remarkable Pro-Life Women” in politics, medicine, media, and other key fields. The usual print run is 10,000 copies, but some issues have gone up to 20,000. Housing, childcare, and insurance coverage are still major problems. Sometimes, though, there are major sources of support that students just don’t know about. Sometimes staff of a campus health center or counseling service don’t know about them, either. Often they are more likely to know about the nearest abortion clinics and to refer students to them automatically. The FFL program is designed to ensure that students are offered information on positive alternatives. When challenged, it’s hard for administrators or students who take a “pro-choice” position to be against offering all the choices. Some, in fact, really are pro-choice and work with FFL on alternatives. Other obstacles often add to the stress of financial pressures on pregnant students: strict class-attendance requirements that are hard to meet when morning sickness is severe; inability to park near classrooms when walking is difficult during late pregnancy; small student desks that are hard to fit into as the due-date approaches. After delivery, problems include lack of diaper-changing stations in campus restrooms and scarcity of private places on campus to nurse a baby. Minor policy changes and a little extra spending can remedy these problems, but some faculty and administrators are either too rigid to make the changes or totally unaware of the problems. Speaking at California’s Pepperdine University in 2006, actress Patricia Heaton drew a large crowd and emphasized the need for positive alternatives to abortion. The campus pro-life group, Dean of Students Mark Davis recalls, accepted the challenge and said they would like to host a resources forum; so “we worked together to make that happen the following year.” Pepperdine, which is affiliated with the Church of Christ, established a task force to look at campus resources and develop proposals for improvement. Pepperdine, which had a shortage of on-campus housing, used to tell even married students that they couldn’t live on campus with children. That policy has changed; children are now welcome, and parents with children can live in a graduate-student area. There was some worry that grad students might be bothered by the noise children make; but Davis says the response “has been better than I expected” and that students seem to enjoy seeing children around. At least 35 colleges and universities have hosted Pregnancy Resource Forums. (Only Georgetown has one every year.) I checked most of their websites, focusing especially on pages dealing with counseling centers and health services.17 Some sites show real progress. I was astonished to find, though, that very few campus counseling centers even mention pregnancy on their pages. Many centers name worries that might lead students to seek counseling-from test anxiety and eating disorders to serious depression-yet say not one word about pregnancy or abortion. What is a pregnant, worried, and scared young woman to do when even the counseling center seems oblivious to her problems? And what are students who suffer post-abortion guilt or grief to do? The best statements of support that I found (though not on counseling pages) are on the websites of the University of Notre Dame and Boston College. Both are positive in tone and list many specific sources of help. Thus Notre Dame declares its commitment “to life and to offering students resources that support the choice of life.” It gives contact information for three staff members identified as “Pregnancy Support Advocates who can provide confidential information and assistance.” It also suggests other sources of aid, both on campus and off.18 Other campuses could use the Notre Dame statement as a template for their own. And they should be sure there are links to it on the counseling, campus-ministry, and health-center pages. Another fine example is a planned residence for pregnant college students in Belmont, N.C., that’s expected to help many students stay in school. Although it didn’t result from a Pregnancy Resource Forum, it has strong links with Feminists for Life. It’s a project of Room at the Inn, a Charlotte-based Catholic ministry that offers residential care to pregnant women in need. Cynthia (Cindy) Brown, then director of the group, became aware of the FFL approach several years ago. 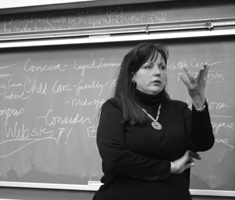 After Brown studied their website, she and her board began considering a residence for pregnant college women, and Serrin Foster advised them about it. Abbot Placid Solari of the Benedictines’ Belmont Abbey, a board member, thought it was a great idea. He and his fellow monks offered land where the residence could be built, next door to their Belmont Abbey College. A 2005 forum at Virginia’s College of William and Mary did not lead to much information about pregnancy/parenting resources on the administration’s web pages. But the W & M pro-life group developed a brochure, “Practical Help for You and Your Baby,” that’s chock-full of such information. Although it’s on the Students for Life web pages, plans to make it widely available on campus in printed form apparently have stalled. The counseling-center director says he saw a version of it at one point, and “we felt their brochure was very well done.” It’s not clear where the bottleneck is.23 But I suspect a major push could lead to wide distribution. Resources forums have produced more emphasis on alternatives on web pages of many other campus pro-life groups. Yet many students may never see those pages. The challenge now is to get more of the vital information onto the web pages of campus counseling and health centers-and into printed brochures for their reception rooms. The Georgetown experience suggests the enormous advantage of having one office on campus that’s responsible for improving resources and making sure students know about them. Feminists for Life now is pressing Congress to provide $10 million in matching grants to establish such offices. The plan is to give a $50,000 grant to each of 200 campuses. The offices would hold resources forums and work constantly for new or better services. Congressional action is not expected before next year, but FFL leaders hope to pick up more sponsors in the meantime. They would like to see the bill become an issue in this year’s presidential and congressional campaigns. Speaking of the major-party presidential candidates, Foster comments: “I really hope that the political operatives around these two will allow them to go down the path where they listen to the real needs of women.” She realizes the Stanton bill may face challenge from people who worry about starting new programs in a time of huge budget deficits. But $10 million is a tiny sum-not even pocket change-when people are trying to wrap their minds around trillions of dollars in government spending. Foster calls $10 million “a very modest investment for major returns” and says she’s speaking of start-up money rather than permanent subsidies. FFL has a new invention to help push the bill: a student-led Rally for Resources. Besides pressing for change on the host campus, rally organizers collect signatures on petitions for the Stanton bill.29 Meanwhile, Serrin Foster is still thinking ahead. She would like “to have a national summit on pregnancy and parenting.” Ireland did this awhile back, she says, and participants included a former prime minister as well as parliament members on both sides of the abortion debate. If Ireland can do it, why can’t we? ©2008. This article was originally published in the Summer 2008 issue ofThe Human Life Review. Reprinted with permission from The Human Life Foundation and author Mary Meehan. 1. Serrin Foster, telephone interview by author, 13 June 2008, audio recording. Unless noted otherwise, quotations from Foster are from this interview or a follow-up interview by author, 2 July 2008, audio recording. FFL staff member Cat Clark provided additional information. 2. The American Feminist, Fall/Winter 2007, 3. 3. Quoted in Rosemary Bottcher, “Celebrating 25 Years of Pro-Life Feminism,” ibid., Summer 1997, 8-9. For histories of Feminists for Life, see Rosemary Oelrich Bottcher, “The Conception and Life of FFL,” ibid., Fall 2002, 3-6; and Cindy Osborne, “Pat Goltz, Catherine Callaghan and the Founding of Feminists for Life,” in Mary Krane Derr and others, ProLife Feminism: Yesterday and Today, 2nd ed. 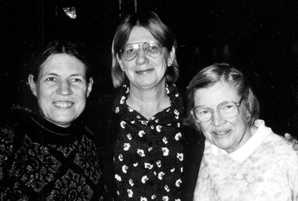 (Feminism and Nonviolence Studies Association, 2005), 219-24. I am indebted to Pat Goltz for fact-checking my two paragraphs on the early years. 4. Gail Grenier Sweet, ed., Pro-Life Feminism: Different Voices (Toronto: Life Cycle Books, 1985). I contributed to the anthology and was a member of Feminists for Life at the time. 5. Feminists for Life of America, Form 990 for tax year ending June 30, 2008. 6. The American Feminist, Fall/Winter 2007, 4-19. 7. Patricia Heaton, “Rewarding Motherhood,” ibid., Fall 2003-Winter 2004, 3 (original was in italics). 8. 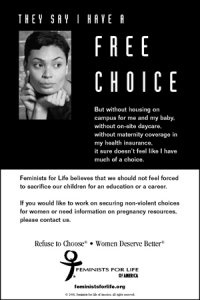 “They Say I Have a Free Choice” (Washington: Feminists for Life of America, 2000); and Nicole M. Callahan, “Revolution on Campus,” The American Feminist, Summer/Fall 2004, 3-8. 9. Chaunie Saelens Brusie, “Chaunie’s Story,” 14 Feb. 2008 and 5 May 2008. “WIC” means the Women, Infants, and Children program, which also provides supplemental food for babies and young children. 10. “You’re Not Alone Anymore” (Washington: Feminists for Life of America, 2000). 11. Quoted in Nicole M. Callahan, “Seeds of Change at Georgetown,” The American Feminist, Summer-Fall 2004, 12-14, 13. 12. Quoted in Rachel Koontz, “Speaker Wants Better Campus Services for Pregnant Students,” 13 April 2007, www.northbynorthwestern.com (go to Archives and search under “pregnancy support”). 13. Quoted in Callahan (n. 11), 14. Carol Day provided additional information via an e-mail from Georgetown media relations director Andy Pino to the author, 1 Aug. 2008. 14. Mark Davis, interview by author, 21 June 2008, audio recording. 15. “Pregnancy,” http://seaver.pepperdine.edu/studentaffairs/content/handbook/2008/policy/17-pregnancy.pdf (italics in original). 17. My count of 35 campuses is based mainly on lists at FFL’s Historical Speaking Schedule. In checking websites, I may have missed some material, since some sites are huge and hard to navigate. 18. University of Notre Dame, “Assistance for Pregnant Students,” http://osa.nd.edu/departments/pregnant.shtml; and “Boston College Pregnancy Services,” www.bc.edu/offices/odsd/wrc/pregnancy.html. 19. Cynthia Brown, telephone interview by author, 30 June 2008; Jeannie Wray, telephone interview by author, 24 June 2008; and www.rati.org. 20. University of Kansas, www.studenthealth.ku.edu/wellness/hiv_clinic_map.shtml. 22. Clarion University, “Pregnancy and Parenting Resources Schedules Forum,” 25 March 2008; and “Clarion University Hosts Parenting Forum,” 18 April 2008. 23. “Pregnancy Resources Brochure,” www.wm.edu/so/studentsforlife/resources.php; Kristin Coyner, e-mail to author, 11 July 2008; and Kelly Crace, telephone interview by author, 31 July 2008. 24. Dasha Vinogradsky, “Some Students Juggle Papers, Exams, Diapers,” 19 Oct. 2007, www.chicagomaroon.com (search under “pregnancy”); and “Family Resource Center,” http://grad-affairs.uchicago.edu/page/resources-university-parents. 25. See http://studentparents.berkeley.edu; second Foster interview (n. 1); and Francisco Antonio, “Every Little Bit: BSL Diaper Drive,” Berkeley Students for Life newsletter, Fall 2007, 1 & 2. 26. Alicia Marie Dean, e-mails to author, 27 June 2008 and 1 July 2008. 27. See http://thomas.loc.gov (search under “Elizabeth Cady Stanton Pregnant and Parenting”). 28. Pat Goltz, e-mail to author, 30 July 2008. 29. “Student Activists Take to the Public Square,” The American Feminist, Spring/Summer 2008, 34.